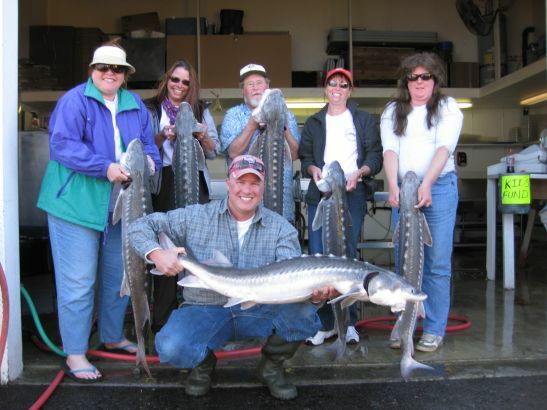 If you're seriously looking for a guided fishing trip on the Columbia River, please continue reading ... you can also call us at 503-501-2424. 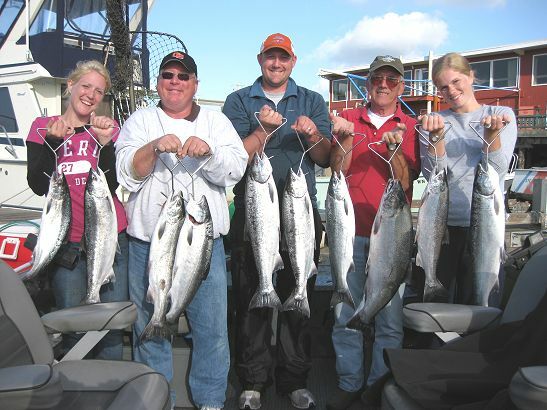 We want you to have a fun and successful Columbia River fishing trip and we definitely want you to go fishing with us. However we do know that for some reason some of you may not choose us, if this is the case, we still want to make sure that you have the knowledge to make a good decision about who you do ultimately decide to go with and that is why we've written this. We have two boats. All of our guided fishing trips are run in our spacious wide body custom made boats that very comfortably seat up to six anglers! If Total Fisherman Guide Service doesn't appear to have what you're looking for, please let us know, because if we can't take care of you, we will always point you in the direction of a great fishing guide that can. If we refer you to another guide, they're going to be someone that is going to take care of you and who also meets the same high standards that we hold ourselves accountable to. On this page we are going to give you some of our hard earned perspective on what you should and shouldn't be looking for when comparing fishing guide services. We catch a lot of fish and we can prove it. 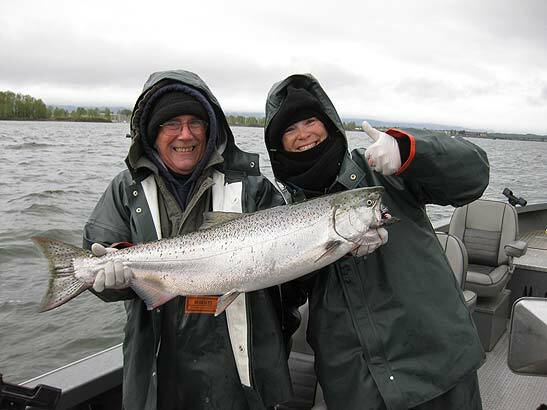 Total Fisherman guide service is ran by two expert Columbia River salmon fishing guides, husband and wife team, Kevin Newell & Lacey DeWeert. We run a successful and very professional operation. The criteria you should be looking for in a guide service and the traits of successful fishing guides that you read about on this page definitely apply to us. We know you want to go with a pro and not just any pro; you want to go with guides that are subject matter experts for the areas that they fish. Right? Don't just take our word for it. 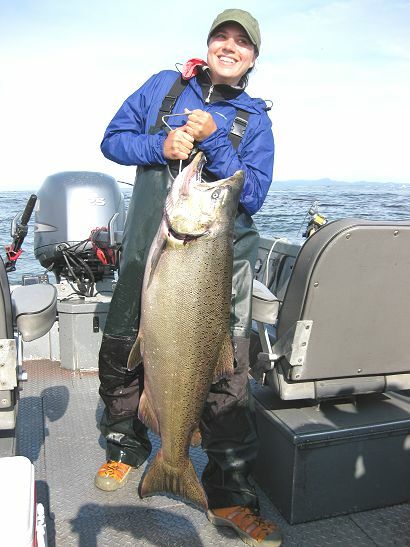 We have videos, pictures, and articles that prove that we not only know what we are talking about, but we've also put much of our knowledge in writing and also have photo and video evidence of real world results to back it up (more evidence than you will find on any other NW fishing guide web site). Videos are as close as you're going to get to being in the boat! This site is also loaded with pictures of happy customers and of the fish they've caught, these photos give you an idea of what kind of catch you can expect. Notice our customers are smiling ... it's because they're having fun! Our Photos Page is HERE. We enjoy fishing and it shows. Please take some time to read our "Why Go Fishing With Us?" page as well as our "Total Fisherman Philosophy" at the bottom of this page. Why do we go through so much effort to show that we definitely have what it takes? 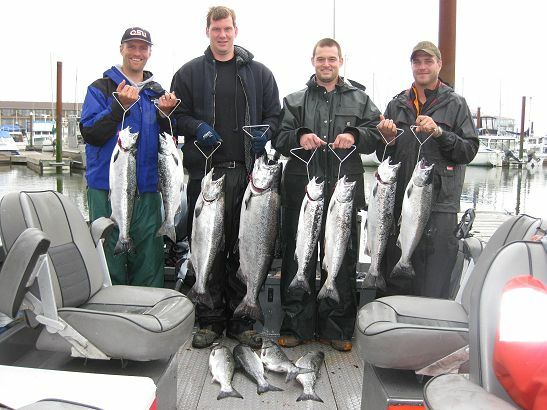 Because we know guided fishing trips on the Columbia River are a large investment of time, money and effort. We want customers that are really going to take the time to make an informed decision, not just someone who buys into a web site that is nothing more than a fancy online brochure with a lot of promises. We want a long term relationship based upon success, fun, and honesty. We want customers who are looking for the same thing. We know that if you come fishing with us you are quickly going to realize that you made a good decision, you're going to come back again, and you're going to tell your friends about us. If we didn't know this then we wouldn't go through this much effort; we would just setup a fancy web site, promise the world and not deliver, and not worry about it because we would have an endless stream of customers. This doesn't work for us, we don't want to just take customers fishing, we want to take customers that we know are going to become friends. 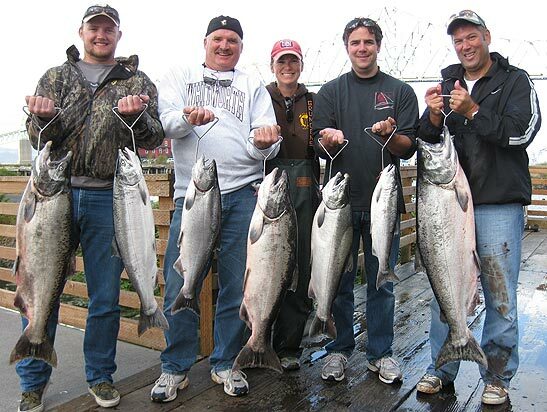 Fishing guides in the NW are almost all within $15 to $20 of each other on a per person basis. These small variations in pricing should be inconsequential compared to your investment of time, effort and hope. Our price is in the middle of the pack, we charge $225 per person. 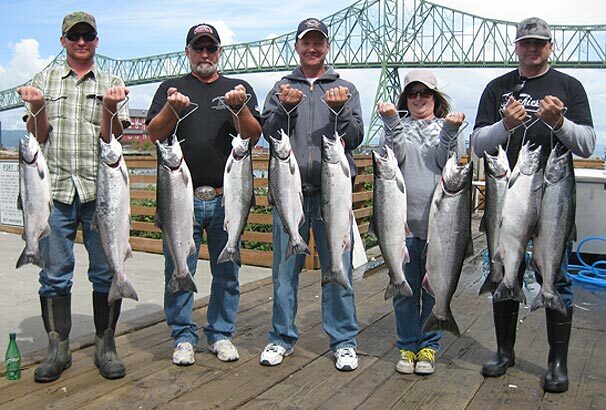 We feel that $225 per angler is a value considering our top of the line equipment, boats and the inclusion of vacuum packaging (in Astoria) and filleting as part of your trip. We spare no expense to make your trip a great success. Do you really want to make your choice based upon someone being the cheapest? All guides aren't created equal, it's not like buying a pair of shoes where price shopping makes sense. - Very new to guiding. - The guide doesn't plan on having any expense associated with your trip. This means the guide is going to spend an extremely low amount of effort and expense on your trip. An example would be, motoring out from the boat launch, dropping anchor, and start recommending that you quit a few hours before the trip is supposed to be over ... because the fishing is bad. Have you seen this? 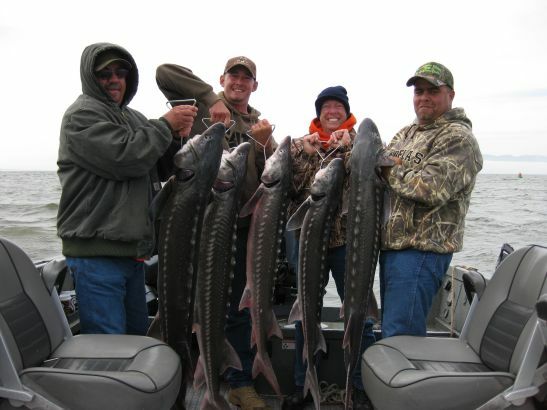 "We're the best fishing guides and we catch the most fish & the biggest fish! "or "Fishing is red hot at Buoy 10 right now, book before it's too late!" or "We caught three Chinook over 50 pounds last week and one over 60!" Really? Of all of the fishing guides in the NW ... you're the best? You're also so modest that you have to tell everyone how great you are? You're the best but you still have to use a heavy handed sales approach to get people to go fishing with you? Folks do you really believe this stuff? Is this really the person you want to be in the boat with all day? Don't you think it's more likely that these things are just being said to get you in the boat and get your money? Even if they were true don't you think that saying this to the customer creates such a high expectation that anything less is going to be a let down? After all it is fishing, and some of the day's results hinge on factors that are uncontrollable by the guide. Wouldn't a good, caring and reputable guide service know this and err on the side of modesty and setting realistic expectations? Let's say for some reason the fishing has been incredible and we are catching easy limits of fish and lots of huge fish, AND we happen to have an open day and a customer calls inquiring about going. Even though it's true, we're are not going to tell them that the fishing has been insane and that we caught 22 salmon yesterday or caught 40 sturgeon and none of them were under 50" and we had six triples! Why? Because all great streaks of fishing have to end sometime and if the customer booked with the expectation of having a day like I described above but didn't, then they are going to be disappointed. They will probably still limit out on nice fish but maybe not as quickly as I described, or maybe not as big, and that will turn what should have been viewed as a very good experience into something less then what was expected. What do we do in a situation like this? We just tell you that the fishing has been very good, we've been getting some nice fish and we expect this to continue. The truth is, some of our fishing is so good, that if we were to tell you exactly how good it currently was, it would probably seem like a lie. It's also possible that since fishing can and does change, you could show up and have something less then what we described and be disappointed even though it was great fishing. We aren't going to do this to you or to ourselves. Setting a realistic expectation is a huge part of this business. Setting a realistic expectation is absolutely what we strive to do and our next goal is to over deliver on your expectations. 1. They're on the water all the time which means they know what the fish are doing and how to catch them. When the fishing is great they are going to do better than great, and likewise if for some reason the fishing is bad they will still do OK, while everyone else is doing horrible. It's a sliding scale that is always above what the average guide and fisherman is able to pull off. There is no replacement for experience and time on the water. 2. A huge percentage of their trips are made up of repeat customers. Why? Because they catch fish and treat their customers well. It's simple. 3. They act like a professional amongst their peers. Why? Because if you're a hell of a good fishing guide that walks the walk and gets the job done, then you don't need to go around telling everyone else how great you are. You know that your reputation off the water is just as important as your reputation for catching fish and treating your customers well. People know when you're a great fisherman, you don't need to remind them or try to prove it. 4. Focused with attention to detail. 5. They listen, they aren't always doing the talking. 6. Very driven to catch fish and make your day productive, but also able to be easy going. This is important to be able to balance because catching fish is a huge priority but so is having a good time. 7. They do things the right way. They don't cut corners. 8. Only one type of equipment, high quality. 9. Only one attitude, success. If they don't envision success then they are going to offer to reschedule your trip. 10. Guides like this don't need a ton of new customers because their boats are typically full of repeat customers and referrals. 11. They don't need to negotiate on pricing and make deals because no matter what, they are going to be fishing when the fishing is good. These guides will book their open dates now or they will book them later, but either way they will have the majority, if not all of the season booked by the time the season arrives. 12. None of them are on the low end of the pricing scale. They all charge the average price or more, and they get it. You want to look for these qualities, and when you find them in a guide that you mesh with then you want to hold on tight. What are you looking for in a fishing trip? If you looked through our website and called or emailed us with any questions you may have had, and then you still decided to not fish with us, then the following are the only possible reasons we could think of that would cause someone to not choose us. By the way if there is something that we haven't covered on this page or on our site please pick up the phone and call us, email is fine too. 1. "Your prices are too high." We already went into this in quit a bit of detail, but it boils down to this. If you're looking for a cheap trip then expect cheap results and equipment, on a less than ideal boat, with a less than ideal captain and/or crew. 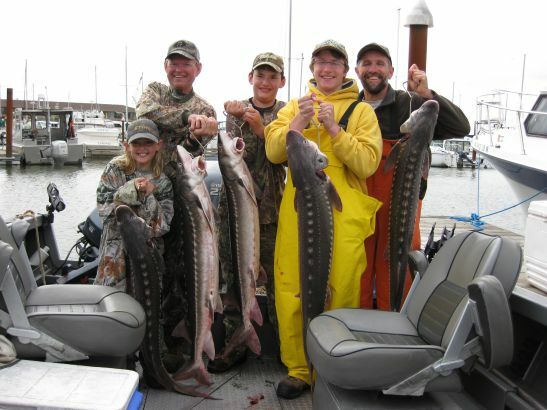 Go on a charter boat or find a fishing guide on Craig's List if price is such a huge factor. There is a reason all of the guides in the NW are around $185 to $215 per person. This is the price it takes to stay in business, maintain the equipment, and have enough gas, bait and expendable equipment on-board to provide a great fishing trip. If someone is charging less than this, then they are going to be lacking one or more of the critical elements that it takes to make your trip a success and this is why they have to compete on price. Guided trips are expensive because the boats cost 45 to 75 thousand dollars each, plus all of the fishing equipment, fuel, bait, insurance, storage, maintenance etc. For $200 per person you get to fish on a fast high quality fish catching machine with top of the line equipment. PLUS you have someone on-board who knows how to use the equipment, keeps you out of harms way, can get you on the fish in a hurry, cleans the fish, cleans the boat, deals with all of the details, etc. If you want this same quality and experience then your only other option is to buy all of this stuff and do it yourself. You will also have to fish a ton, so you have the experience and knowledge to catch fish at the same level as a guide AND you're going to find that after spending all of this money and effort, it was a heck of a lot cheaper and less hassle to just go on a good guided trip. I fish professionally over 175 days a year and fish with friends and family and on non paying trips 20 to 30 days a year. If I wasn't a fishing guide I certainly wouldn't have the huge amount of money and hassle wrapped up in owning a boat and all of the equipment. I would just pay for 20 to 30 guided trips a year. It's way cheaper to pay a guide then to do it yourself, and $200 is nothing compared to the expense of owning and fishing in your own boat and dealing with all of the assorted expense and hassle. 2. "You don't have a Fish Catch Guarantee". These "guarantees" generally read "If nobody in your party hooks a fish then your next trip is half price!" or "If nobody in your party catches a fish then your next trip is half price!". Like I said earlier we only had two days that would have fallen under this description last year. We don't have fish catch guarantees and we never will. Fishing is a lot about skill and a little about luck. We create our own luck by working hard and fishing in the places and during the times that are most productive. We want customers that understand that there is a lot of skill required to put you on the fish, and that there is also some skill required on your part to hook and land the fish. We are great teachers and show you everything you need to know to be successful on our boats, but if you aren't willing to pay attention, or put out little effort, then all of the fish catch guarantees in the world aren't going to help you. If the fishing is exceptionally good or maybe not as good as it could have been, then that's where luck factors in. Sometimes we get really lucky and extraordinarily great things happen, and on rare occasions the opposite happens and the fish just aren't there or don't cooperate. Both of these occurrences are out of the norm and don't happen every day. Either way these are factors that are out of our control. We fish in the best areas, at the best times, using the best of everything so we maximize the possibility of having the extraordinarily great things happen while minimizing the chance of having bad fishing happen. Most days we just have good fishing, that is the norm. If we get out there on the morning of your trip and something has changed dramatically overnight; it's just not looking good and there is nothing to lead us to believe that it's going to get better, then a half day of fishing for half price is definitely an option. We normally don't do half day trips but this is something we are willing to do when things just don't turn out like planned. When you join us on our boats we're a team, and there isn't a member of that team that wants to go back to the dock empty handed, and there isn't a single member of that team that doesn't have something significant riding on the outcome of the day. This risk and outcome both good and bad are shared. We as fishing guides understand this and we want customers that understand this as well, not someone looking for "guaranteed" results. Poor fishing days are really rare because we're very good at what we do, and also because we go where the best trip is going to happen. Which means we go to the location that has the best combination of; high numbers of biting fish, in the most comfortable/safe conditions possible. Come on, seriously, a fish catch guarantee? This is just a sales gimmick to get you in the boat. When you don't catch anything with one of these guides, are you really going to come back even at half price? Why don't any of these "guarantees" offer to give you the price for that day's trip for half price? Because they are banking on you not coming back, that's why. We don't need to offer a guarantee to get folks in the boat, and we wouldn't even consider taking someone who would only go because they've been convinced it's a "sure thing" or "guaranteed". Being a great fisherman is a skill, that is why you hire the most skilled guide you can find, not because they promise you the world to get your money. Fish catch guarantees are a gimmick and we don't do business that way. 3. "I don't want to drive that far." If having to drive an extra hour to where the best fishing is happening is a huge issue, you probably shouldn't go fishing. Why? Because if you do book a trip that is close to wherever it is that you are located, and you're 5 hours into that trip and not catching anything, you're going to be pretty mad at yourself for not having driven an extra hour or so to go to where the best fishing is happening. We understand this. We know you don't want to drive very far, but we can't bring the fishing to you. We have to go to the fish, and we have to convince some of our customers that this is in their best interest. We don't take the easy way out. We don't just fish close to home or wherever we feel like it and hope for the best. We're going to be where the best fishing is happening and we hope you join us. Please feel free to email us but we prefer if you give us a call on the phone and spend a few minutes or a half hour talking with us and asking questions. You will get to know us a lot better, get more questions answered, and more insight gained in a five minute telephone conversation then in five emails! Take care and we hope to earn your lifelong business!